"Skeletal structure" redirects here. For other uses, see Skeleton. The skeletal formula, also called line-angle formula or shorthand formula, of an organic compound is a type of molecular structural formula that serves as a shorthand representation of a molecule's bonding and some details of its molecular geometry. A skeletal formula shows the skeletal structure or skeleton of a molecule, which is composed of the skeletal atoms that make up the molecule. It is represented in two dimensions, as on a piece of paper. It employs certain conventions to represent carbon and hydrogen atoms, which are the most common in organic chemistry. An early form of this representation was first developed by the organic chemist Friedrich August Kekulé von Stradonitz, while the modern form is closely related to and influenced by the Lewis (dot) structure of molecules and their valence electrons. For this reason, they are sometimes termed Kekulé structures or Lewis-Kekulé structures. Skeletal formulae have become ubiquitous in organic chemistry, partly because they are relatively quick and simple to draw, and also because the curved arrow notation used for discussions of reaction mechanism and/or delocalization can be readily superimposed. Several other methods for depicting chemical structures are also commonly used in organic chemistry (though less frequently than skeletal formulae). For example, conformational structures look similar to skeletal formulae and are used to depict the approximate positions of the atoms of a molecule in three-dimensional space, as a perspective drawing. Other types of representations, e.g., Newman projections, Haworth projections and Fischer projections, also look somewhat similar to skeletal formulae. However, there are slight differences in the conventions used, and the reader needs to be aware of them in order to understand the structural details that are encoded in these depictions. While skeletal and conformational structures are also used in organometallic and inorganic chemistry, the conventions employed also differ somewhat. The skeletal structure of an organic compound is the series of atoms bonded together that form the essential structure of the compound. The skeleton can consist of chains, branches and/or rings of bonded atoms. Skeletal atoms other than carbon or hydrogen are called heteroatoms. Heteroatoms and other groups of atoms that give rise to relatively high rates of chemical reactivity, or introduce specific and interesting characteristics in the spectra of compounds are called functional groups, as they give the molecule a function. Heteroatoms and functional groups are known collectively as "substituents", as they are considered to be a substitute for the hydrogen atom that would be present in the parent hydrocarbon of the organic compound in question. Carbon atoms are represented by the vertices (intersections or termini) of line segments. For clarity, methyl groups are often explicitly written out as Me or CH3, while (hetero)cumulene carbons are frequently represented by a heavy center dot. Hydrogen atoms attached to carbon are implied. An unlabeled vertex is understood to represent a carbon attached to the number of hydrogens required to satisfy the octet rule, while a vertex labeled with a formal charge and/or nonbonding electron(s) is understood to have the number of hydrogen atoms required to give the carbon atom these indicated properties. Optionally, acetylenic and formyl hydrogens can be shown explicitly for the sake of clarity. Hydrogen atoms attached to a heteroatom are shown explicitly. The heteroatom and hydrogen atoms attached thereto are usually shown as a single group (e.g., OH, NH2) without explicitly showing the hydrogen–heteroatom bond. Heteroatoms with simple alkyl or aryl substituents, like methoxy (OMe) or dimethylamino (NMe2), are sometimes shown in the same way, by analogy. Lone pairs on carbene carbons must be indicated explicitly while lone pairs in other cases are optional and are shown only for emphasis. In contrast, formal charges and unpaired electrons on main-group elements are always explicitly shown. In the standard depiction of a molecule, the canonical form (resonance structure) with the greatest contribution is drawn. However, the skeletal formula is understood to represent the "real molecule" — that is, the weighted average of all contributing canonical forms. Thus, in cases where two or more canonical forms contribute with equal weight (e.g., in benzene, or a carboxylate anion) and one of the canonical forms is selected arbitrarily, the skeletal formula is understood to depict the true structure, containing equivalent bonds of fractional order, even though the delocalized bonds are depicted as nonequivalent single and double bonds. Since skeletal structures were introduced in the latter half of the 19th century, their appearance has undergone considerable evolution. The graphical conventions in use today date to the 1980s. Thanks to the adoption of the ChemDraw software package as a de facto industry standard (by American Chemical Society, Royal Society of Chemistry, and Gesellschaft Deutscher Chemiker publications, for instance), these conventions have been nearly universal in the chemical literature since the late 1990s. A few minor conventional variations, especially with respect to the use of stereobonds, continue to exist as a result of differing US and UK and Continental European practice, or as a matter of personal preference. As another minor variation between authors, formal charges can be shown with the plus or minus sign in a circle or without the circle. The set of conventions that are followed by most authors is given below, along with illustrative examples. (1) Bonds between sp2 and/or sp3 hybridized carbon or heteroatoms are conventionally represented using 120° angles whenever possible, with the longest chain of atoms following a zigzag pattern unless interrupted by a cis double bond. Unless all four substituents are explicit, this is true even when stereochemistry is being depicted using wedged or dashed bonds (see below). (2) If all four substituents to a tetrahedral carbon are explicitly shown, bonds to the two in-plane substituents still meet at 120°; the other two substituents, however, are usually shown with wedged and dashed bonds (to depict stereochemistry) and subtend a smaller angle of 60–90°. (3) The linear geometry at sp hybridized atoms is normally depicted by line segments meeting at 180°. (4) Carbo- and heterocycles (3- to 8-membered) are generally represented as regular polygons; larger ring sizes tend to be represented by concave polygons. (5) Atoms in a group are ordered so that the bond emanates from the atom that is directly attached to the skeleton. For example, the nitro group (NO2), is denoted —NO2 or O2N—, depending on the placement of the bond. In contrast, the isomeric nitrite group is denoted ONO, with the bond appearing on either side. For example, in the image below, the skeletal formula of hexane is shown. The carbon atom labeled C1 appears to have only one bond, so there must also be three hydrogens bonded to it, in order to make its total number of bonds four. The carbon atom labelled C3 has two bonds to other carbons and is therefore bonded to two hydrogen atoms as well. A ball-and-stick model of the actual molecular structure of hexane, as determined by X-ray crystallography, is shown for comparison, in which carbon atoms are depicted as black balls and hydrogen atoms as white ones. NOTE: It doesn't matter which end of the chain you start numbering from, as long as you're consistent when drawing diagrams. The condensed formula or the IUPAC name will confirm the orientation. Some molecules will become familiar regardless of the orientation. Any hydrogen atoms bonded to non-carbon atoms are drawn explicitly. In ethanol, C2H5OH, for instance, the hydrogen atom bonded to oxygen is denoted by the symbol H, whereas the hydrogen atoms which are bonded to carbon atoms are not shown directly. Lines representing heteroatom-hydrogen bonds are usually omitted for clarity and compactness, so a functional group like the hydroxyl group is most often written −OH instead of −O−H. These bonds are sometimes drawn out in full in order to accentuate their presence when they participate in reaction mechanisms. Shown below for comparison are a ball-and-stick model of the actual three-dimensional structure of the ethanol molecule in the gas phase (determined by microwave spectroscopy, left), the Lewis structure (centre) and the skeletal formula (right). All atoms that are not carbon or hydrogen are signified by their chemical symbol, for instance Cl for chlorine, O for oxygen, Na for sodium, and so forth. These atoms are commonly known as heteroatoms in the context of organic chemistry. Sulfonate esters are often leaving groups in nucleophilic substitution reactions. See the articles on sulfonyl and sulfonate groups for further information. A protecting group or protective group is introduced into a molecule by chemical modification of a functional group to obtain chemoselectivity in a subsequent chemical reaction, facilitating multistep organic synthesis. Two atoms can be bonded by sharing more than one pair of electrons. The common bonds to carbon are single, double and triple bonds. Single bonds are most common and are represented by a single, solid line between two atoms in a skeletal formula. Double bonds are denoted by two parallel lines, and triple bonds are shown by three parallel lines. In more advanced theories of bonding, non-integer values of bond order exist. In these cases, a combination of solid and dashed lines indicate the integer and non-integer parts of the bond order, respectively. Note: in the gallery above, double bonds have been shown in red and triple bonds in blue. This was added for clarity - multiple bonds are not normally coloured in skeletal formulae. In recent years, benzene is generally depicted as a hexagon with alternating single and double bonds, much like the structure originally proposed by Kekulé in 1872. As mentioned above, the alternating single and double bonds of "1,3,5-cyclohexatriene" are understood to be a drawing of one of the two equivalent canonical forms of benzene, in which all carbon-carbon bonds are of equivalent length and have a bond order of 1.5. For aryl rings in general, the two analogous canonical forms are almost always the primary contributors to the structure, but they are nonequivalent, so one structure may make a slightly greater contribution than the other, and bond orders may differ somewhat from 1.5. An alternative representation that emphasizes this delocalization uses a circle, drawn inside the regular hexagon of single bonds. This style, based on one proposed by Johannes Thiele, used to be very common in introductory organic chemistry textbooks and is still frequently used in informal settings. However, because this depiction does not keep track of electron pairs and is unable to show the precise movement of electrons, it has largely been superseded by the Kekuléan depiction in pedagogical and formal academic contexts. Solid lines represent bonds in the plane of the paper or screen. Solid wedges represent bonds that point out of the plane of the paper or screen, towards the observer. Hashed wedges or dashed lines (thick or thin) represent bonds that point into the plane of the paper or screen, away from the observer. Wavy lines represent either unknown stereochemistry or a mixture of the two possible stereoisomers at that point. An obsolescent depiction of hydrogen stereochemistry that used to be common in steroid chemistry is the use of a filled circle centered on a vertex (sometimes called H-dot/H-dash/H-circle, respectively)for an upward pointing hydrogen atom and two hash marks next to vertex or a hollow circle for a downward pointing hydrogen atom. A small filled circle represented an upward pointing hydrogen, while two hash marks represented a downward pointing one. An early use of this notation can be traced back to Richard Kuhn who in 1932 used solid thick lines and dotted lines in a publication. The modern wedges were popularised in the 1959 textbook Organic Chemistry by Donald J. Cram and George S. Hammond. Skeletal formulae can depict cis and trans isomers of alkenes. Wavy single bonds are the standard way to represent unknown or unspecified stereochemistry or a mixture of isomers (as with tetrahedral stereocenters). A crossed double-bond has been used sometimes; is no longer considered an acceptable style for general use, but may still be required by computer software. Using dashed lines (green) to show hydrogen bonding in acetic acid. Hydrogen bonds are generally denoted by dotted or dashed lines. In other contexts, dashed lines may also represent partially formed or broken bonds in a transition state. ^ This term is ambiguous, because "Kekulé structure" also refers to Kekulé's famous proposal of hexagonal, alternating double-bonds for the structure of benzene. ^ Brecher, Jonathan (2008). "Graphical representation standards for chemical structure diagrams (IUPAC Recommendations 2008)". Pure and Applied Chemistry. 80 (2): 277–410. doi:10.1351/pac200880020277. ISSN 1365-3075. ^ To prevent a 'kink' from emerging and causing a structure to take up too much vertical space on a page, the IUPAC (Brecher, 2008, p. 352) makes an exception for long chain cis-olefins (e.g., oleic acid), allowing the cis double bond within them to be depicted with 150° angles, so that the zigzags on either side of the double bond can propagate horizontally. ^ Clayden, Jonathan; Greeves, Nick; Warren, Stuart; Wothers, Peter (2001). Organic Chemistry (1st ed.). Oxford University Press. p. 27. ISBN 978-0-19-850346-0. ^ a b Brecher, Jonathan (2006). "Graphical representation of stereochemical configuration (IUPAC Recommendations 2006)" (PDF). Pure Appl. Chem. 78 (10): 1897–1970. doi:10.1351/pac200678101897. ^ American and European chemists use slightly different conventions for a hashed bond. Whereas most American chemists draw hashed bonds with short hash marks close to the stereocenter and long hash marks further away (in analogy to wedged bonds), most European chemists start with long hash marks close to the stereocenter that gradually become shorter moving away (in analogy to perspective drawing). In the past, the IUPAC has suggested the use of a hashed bond with hash marks of equal length throughout as a compromise but now prefers the American-style hashed bonds (Brecher, 2006, p. 1905). 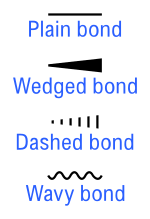 Some chemists use a thick bond and dotted bond (or hashed bond with equal length hashes) to depict relative stereochemistry and a wedged bond and hashed bond with unequal hashes to depict absolute stereochemistry; most others do not make this distinction. ^ The IUPAC now strongly deprecates this notation. ^ Jensen, William B. (2013). "The Historical Origins of Stereochemical Line and Wedge Symbolism". Journal of Chemical Education. 90 (5): 676–677. doi:10.1021/ed200177u.